For those of you not familiar with the term Snips and Snails it relates to anything boyish. So make a masculine card this week to enter at Fairy Fun Fridays. 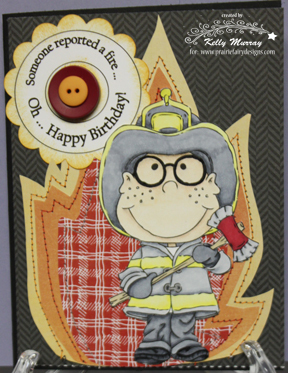 This week I used Fireman Lewis (created by Prairie Fairy Designs) to make a birthday card for someone with a few too many candles. This is my first time stitching on a card, I was nervous at first, thinking it will dull my needles or rip my paper but thought my flames needed a little something extra. I am glad I tried it. Make your masculine card and enter the challenge today so you have the opportunity to win some great images created by Prairie Fairy Designs. Wow!! Kelly, this is so darn cute, love that huge flame and of course sweet Lewis is amazing. I hope you have a wonderful weekend. Oh I looooooooove the flames! Great job on the stitching Kelly - and thanks for your comment on my blog too! Have a great weekend. what a gorgeous background for our fireman....fab colouring.....have a nice weekend! Thanks for joining us at One Stitch at a Time this week, and good luck. AWESOME job, Kelly. I cant believe this is the first time you've stitched on a card!?!? Shuddup!! Well, your a natural, cuz it looks marvelous !! A virtual flame card. LOVE IT! Love the image and the way you did the flame. What a cute card. Love your design. Thanks so much for joining us this week at the Creative Card Crew! Adorable card and the stitching is perfect. This is fabulous!! Thanks for joining us at the Ribbon Carousel Challenge. This card is cute and wonderful... like it with the little fireman... he looks very happ. Thanks for joining us at Creative Stamps Friends this week. I love the colours and the image you used. Thanks for joining us on the Digistamps 4 Joy "Colours of fall" challenge.